The dimensions of miner’s virtual browser has been increased. This solves issues related with websites whose layout changes when the browser has a smaller window dimension (mobile layout). This also helps the miner to load more items in a single page and scroll, in case of websites which display data based on the size of the browser window. Support for ‘Load more content‘ & ‘Scroll to load next page‘ type pagination even when the real listing page is reached by clicking links/buttons from the start page. In earlier versions if the listing page loads more data in same page via a button/link click or scroll and if initial navigation (click, java-script etc.) is required in the configuration itself to load the listing page from another start page, then pagination would fail. This release removes this limitation. More support for extracting data from popups. SQL data export encoding issue related to foreign languages fixed. Encoding issues while exporting text in non-English languages like Chinese fixed. As always you may download and install the latest version from https://www.webharvy.com/download.html. In this blog post, we will take a look at how to scrape images from www.pinterest.com in their full sizes.We follow a two stage extraction process to capture the high-res images from pinterest.com. In the first extraction stage, we capture the image URLs which are present in the listings page. These URLs actually point to smaller sized images (236 Pixels). Then using any Text Editor, we replace the /236x/ with /564x/ in all the URLs. For example the URL : https://s-media-cache-ak0.pinimg.com/236x/99/…. is modified to : https://s-media-cache-ak0.pinimg.com/564x/99/…. In the second extraction stage, we use ‘Add URLs‘ method to add the modified URLs and scrape the full sized images ((564 Pixels) from each of these URLs using a single WebHarvy configuration. This update addresses problems in installing .NET 4.5 on Windows 7 (and earlier Windows versions where .NET 4.5 is not present) during installation process. Only the installer has been updated in this release and WebHarvy application files are unchanged compared to the just previous version. So in case you are already running 4.0.3.128 you can ignore this version. You may download and try the latest version from https://www.webharvy.com/download.html. Let us know in case you have any questions. All WebHarvy application files and installation package are digitally signed (Comodo RSA Code Signing CA) and secured. However in case you get the following Smartscreen warning while trying to install the latest version of WebHarvy, please click the ‘More info‘ link and then click the ‘Run anyway‘ button to proceed with the installation. The above popup message is displayed because we recently changed our .NET dependency from 3.5 to 4.5, thereby considerably reducing the installation package size, and more importantly the code signing agency of our digital certificate has been changed from GlobalSign to Comodo. So the above warning may appear till the new WebHarvy installer gets enough reputation from Microsoft which will take a few weeks time. In case you have any questions or require assistance please do not hesitate to contact our support. Any number of input text fields can be populated with lists of strings/keywords during configuration. WebHarvy will automatically apply all combinations of provided keywords during the mining phase. Know More. Run specified Java Script code on page – know more. This option can be used to load elements on a page which cannot be done using the default navigation options (link-follow, click) provided by WebHarvy. Strings to be input to text fields can now be made a part of the configuration. Know More. Earlier such parameters were automatically taken from the PostData of the configuration. But sometimes, with some websites, the PostData will not contain the input strings submitted and this option helps to correctly load the page displaying data during mining phase. Know More. Helps to extract data by clicking each listing link/button and get data from a popup window or a view in the same page populated by data. This is different from ‘Follow this link’ option because here the data is loaded on the same page (no page navigation) and different from ‘Click’ option because after clicking each link data has to be extracted from page before clicking the next link. Smooth scroll to page end to load elements which are loaded (for example lazy loading of images) only when the elements are made visible by scrolling down. Know More. Select drop-down/list-box/combo-box options during configuration and mining. Again this option allows navigation to result pages when normal configuration is unable to make these selections and load the result page. Know More. ‘Capture Image’ option automatically enabled via HTML/RegEx method in applicable cases. Name downloaded image files by value obtained from a column/cell in miner data table. More. Allows applying ‘Capture More Content’ after selecting ‘Capture HTML’. 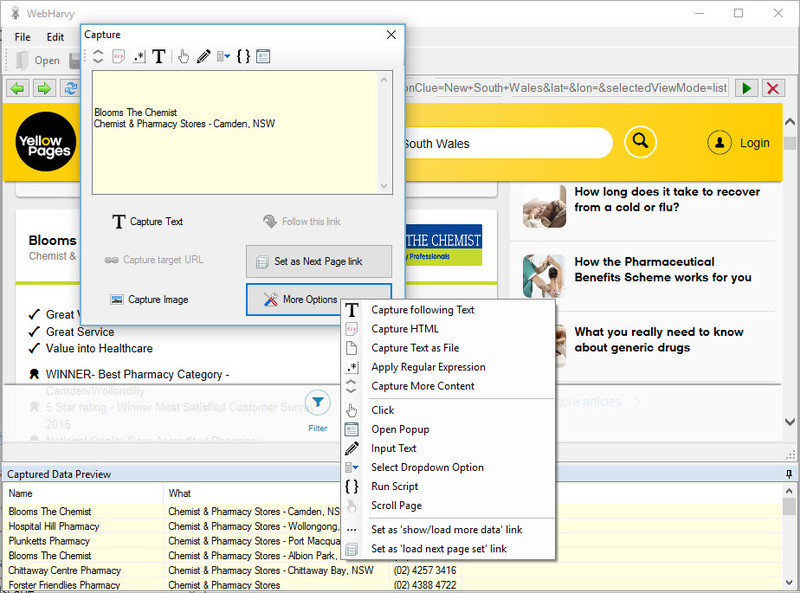 Quick access to items under ‘More Options’ in Capture window via toolbar buttons. You may please download and try the latest version from https://www.webharvy.com/download.html. We have released a new update of our unique Twitter client which is designed to keep your Twitter timeline organized by grouping tweets by the same author over a period of time in a single card. Branches’s mission is to reduce the noise in your Twitter timeline and thereby making it easy for you to consume. Branches does this by grouping tweets from the same handle/author over a period of time and displaying it as a single item. 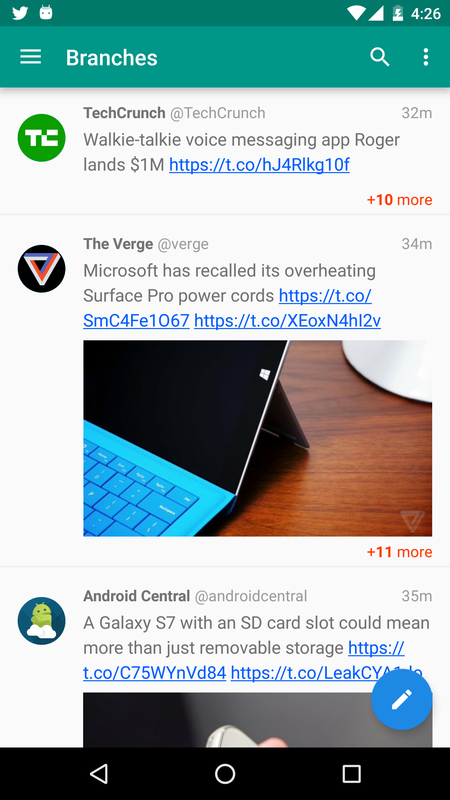 You can tap on this to view each one of the grouped tweets or just ignore it. This lets you follow any number of people on Twitter including frequent tweeters like newspapers, journalists etc. without allowing them to hijack your timeline. Try it ! Branches is an experiment, so right now the app has minimum features and is not ready to replace your current favorite Twitter Client. Consider this an extension/add-on which provides you a different perspective to read Twitter. Of-course based on user feedback we look forward to adding more features and to become a full fledged Twitter Client.